In mid-December the NYC health department announced that 45 cats at Manhattan shelter were infected with a rare low path avian H7N2 virus. While seasonal influenza is rare in cats, we've seen a number of instances where avian influenza viruses have infected felines (see Catch As Cats Can). In short order the number of infected cats, and affected shelters, grew substantially - and barely a week later we saw the NYC Health Dept Statement On A Human H7N2 Infection involving a veterinarian treating infected cats. The illness was a mild one, and the vet completely recovered, but it raised alarm bells over the Christmas holidays as the number of infected cats rose to several hundred - across two states (NY & PA) (see Penn Ag Dept: Some Cats May Have Been Exposed To Avian H7N2). Human infection with H7N2 has only rarely been reported, and is generally mild. 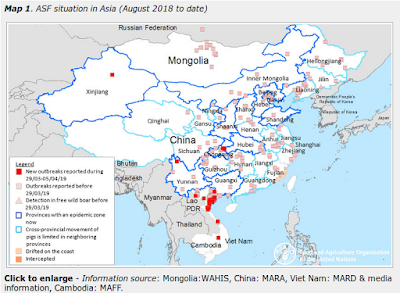 Up until this incident, the U.S. had only detected two other cases of infection with H7N2; one in a farmer in close contact with chickens in 2002 and the other with an unknown exposure in 2003 (Link). Four human cases (two in Wales and two in north-west England) have confirmed Influenza A infection and are closely linked in time and place to the discovery of the H7N2 avian influenza virus. Since there are currently very low levels of seasonal influenza in the UK, it is presumed that they are infected with influenza H7N2. All of which brings us to a study, conducted by researchers at the CDC's Influenza Division, which looks at the virulence and transmissibility of this recent H7N2 outbreak. While they find the H7N2 virus will require additional adaptation before it poses a substantial human health threat, they note the virus replicated with increased efficiency in human bronchial epithelial cells over previous H7N2 strains tested, and were better adapted to using a lower pH for HA activation, similar to seasonal flu viruses. Small steps, but in a unwelcome direction. Recent outbreaks of both LPAI and HPAI H7N9 and H7N8 in the United States, along with the unexpected speed of transmission of H7N2 among cats, is a reminder that HPAI H5 viruses aren't the only avian viruses that we need to keep on our radar. A novel A(H7N2) influenza virus isolated from a veterinarian caring for cats in a New York City animal shelter causes mild disease and transmits poorly in the ferret model. In December 2016, a low pathogenic avian influenza (LPAI) A(H7N2) virus was identified as the causative source of an outbreak in a cat shelter in New York City, which subsequently spread to multiple shelters in New York and Pennsylvania. One person with occupational exposure to infected cats became infected with the virus, representing the first LPAI H7N2 human infection in North America since 2003. Considering the close contact that frequently occurs between companion animals and humans, it was critical to assess the relative risk of this novel virus to public health. Virus isolated from the human case, A/New York/108/2016 (NY/108), caused mild and transient illness in ferrets and mice, but did not transmit to naïve co-housed ferrets following traditional or aerosol-based inoculation methods. Environmental persistence of NY/108 virus was generally comparable to other LPAI H7N2 viruses. However, NY/108 virus replicated with increased efficiency in human bronchial epithelial cells compared with previously isolated H7N2 viruses. Furthermore, the novel H7N2 virus was found to utilize a relatively lower pH for HA activation, similar to human influenza viruses. Our data suggest that the LPAI H7N2 virus requires further adaptation before representing a substantial threat to public health. However, the reemergence of a LPAI H7N2 virus in the Northeastern United States underscores the need for continuous surveillance of emerging zoonotic influenza viruses, inclusive of mammalian species such as domestic felines that are not commonly considered intermediate hosts for avian influenza viruses.